The nine small paintings in this modest show make a wonderful case for Jane Freilicher’s restrained yet lavish art. Most of them date from the last few years and focus on floral bouquets, usually set on windowsills overlooking city or country vistas in ways that mix aspects of still life, landscape and to some extent portraiture. Among the things that engage the eye are color, striking discrepancies or continuities between foreground and background and a kind of diffuse, almost palpable light. The space and scale can seem weird, ostensibly a trifle naïve, or clumsy, but not really. 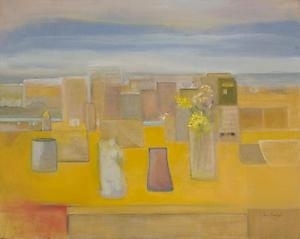 In “Yellow,” a cluster of vases and bowls, most of them without flowers, merges with the upright forms of the buildings beyond, the whole scene unified by a golden light. In “Bouquets,” night has apparently fallen, creating a black curtainlike backdrop that shuts in the five or six vases and boxes and several different blooms. Nonetheless, these nestled forms assume a solemn monumentality, commanding their sill like immense, slightly anthropomorphic monoliths. The contrast of strong, pure colors and soft, modulated ones is the main fuel source in “Study in Blue and Gray,” where a vivid blue vase of white flowers holds sway over a paler bouquet and a hazy expanse of buildings that might almost be a mirage. Ms. Freilicher has learned from Morandi, Redon, Marsden Hartley and Henri Rousseau, all of whom gave a special place to still life and, frequently, to flowers. She makes their lessons her own, extending their tradition and quietly but firmly joining their ranks.